Drainage Area: 51 sq. mi. 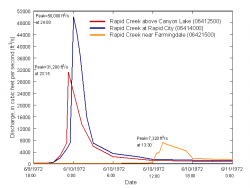 The Friday afternoon of June 9, 1972 was the beginning of a tragedy for Rapid City, South Dakota along the eastern slopes of the Black Hills mountain range. Scattered showers from the previous days had left the ground saturated while a low-level air mass flowing from the east forced moist air up the 7,000 foot-high mountain slopes. Typically, a fast moving air stream quickly pushes such moisture through the area, but on that Friday afternoon there was a slow, almost-stagnant air mass moving over the isolated mountain range. Rapid City (1972 population of approximately 43,000) didn’t anticipate either the magnitude of the storm or the breach of Canyon Lake Dam. At 9:00 a.m., the National Severe Local Storm Forecast Center advised that isolated thunderstorms approaching severe limits (hail larger than ¾” and wind gusts stronger than 60 mph) were expected in western South Dakota during the late afternoon and evening. At noon, the Rapid City National Weather Service (NWS) released similar predictions to the media. During the afternoon, two intense thunderstorms developed. A flash flood warning was issued for the northern Black Hills at 7:15 p.m. and was shortly thereafter expanded to include Box Elder Creek and Rapid Creek. Mayor Don Barnett was notified of the event and at 10:30 p.m. urged immediate evacuation of low-lying areas in a television and radio broadcast. At 10:45 p.m., Canyon Lake Dam failed by overtopping. Looking downstream at the concrete riser structure. 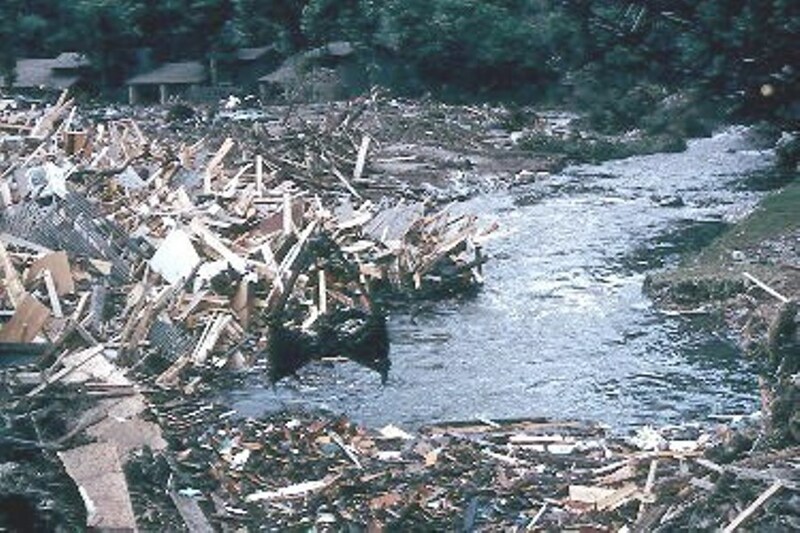 The flash flood within the watershed upstream of the dam carried debris-laden water down into Canyon Lake Reservoir where it accumulated. The dam spillway gates were opened to avert the rising water levels but they soon became clogged. Several men were assigned to remove debris, but the task became impossible when a boat dock from the lakeshore broke loose and lodged in the spillway. Many boats and other debris soon piled up behind the boat dock blocking the reservoir’s outlet. With the spillway obstructed, the water level continued to rise until the dam was overtopped around 10:00 p.m. Water flowed over the earthfill embankment for about 45 minutes before complete breaching of the dam occurred. 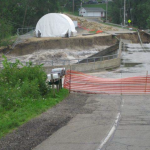 On June 10th at approximately 12:15 am, the floodwave which was estimated to be around 50,000 cubic feet per second reached downtown Rapid City. Rapid City never sounded its four warning sirens and suffered severe losses of both life and property. An estimated 238 lives were lost. Total damages were estimated to be $160 million (or nearly $1 billion in 2015 dollars). 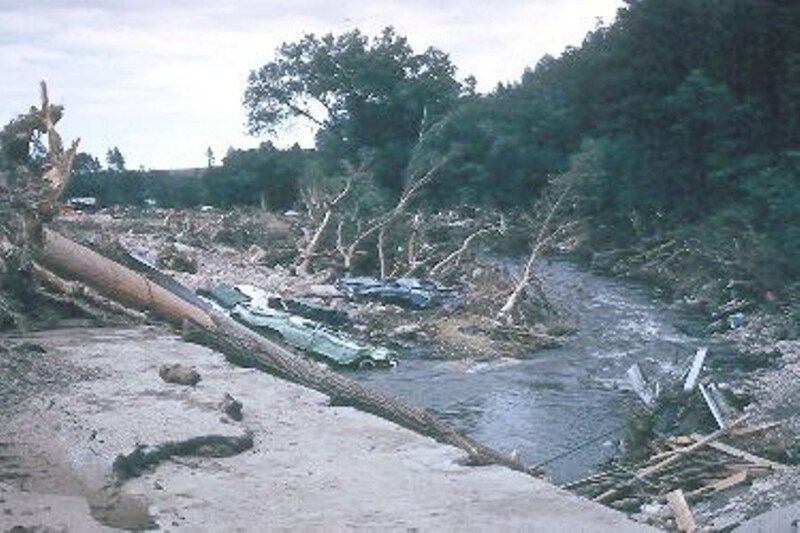 The majority of bridges spanning Rapid Creek, approximately 5,000 automobiles, and 1,335 homes were destroyed by the flood. An additional 2,500 homes were significantly damaged. 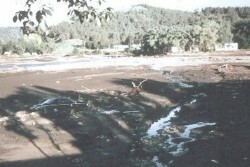 Vast development of flood plains substantially contributed to the damage and loss of life. In order to minimize future losses, 754 acres were subsequently designated as a floodway. 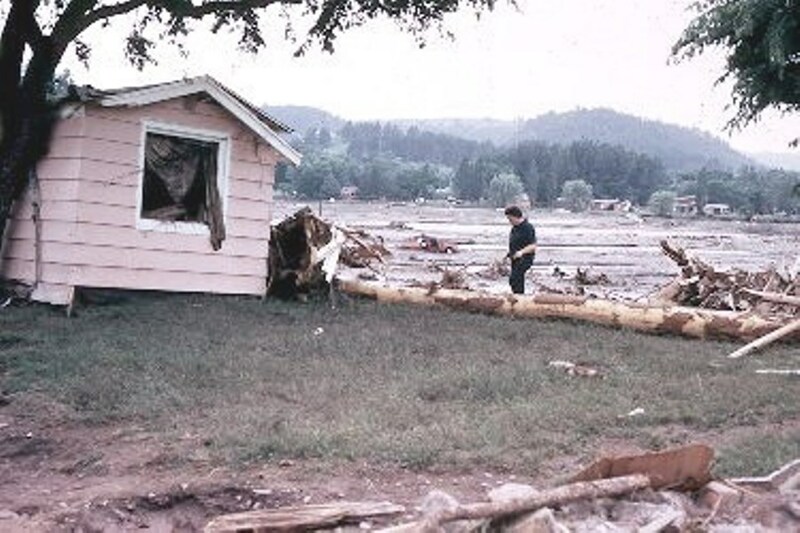 All homes were destroyed or relocated from the floodplain and businesses were given the choice to stay or relocate. Canyon Lake Dam was rebuilt in 1976. (1) National Weather Service (2015). The Black Hills Flood of 1972. National Weather Service website (www.weather.gov). S. Department of Commerce, National Oceanic and Atmospheric Administration, National Weather Service. 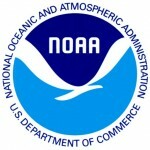 (2) NOAA (1972). National Disaster Survey Report 72-1. 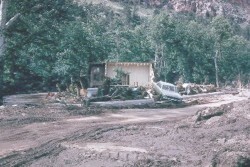 Black Hills Flood of June 9, 1972. S. Department of Commerce, National Oceanic and Atmospheric Administration. 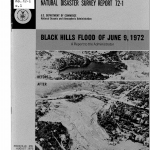 (3) USGS and NOAA (1975). Geological Survey Professional Paper 877. 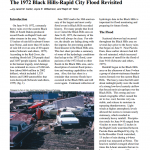 The Black Hills – Rapid City Flood of June 9-10, 1972: A Description of the Storm and Flood. Prepared jointly by the U.S. Geological Survey and the National Oceanic and Atmospheric Administration. The small spillway (background) on Canyon Lake dam became clogged with debris, and the dam was over-topped. 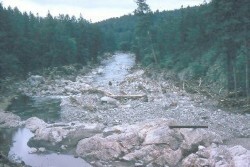 Rapid Creek flows through the dam in a large cut where the dam failed. Houses floated downstream and lodged on the Canyon Lake dam. Erosion on the downstream face of Canyon Lake dam ultimately lead to its failure. 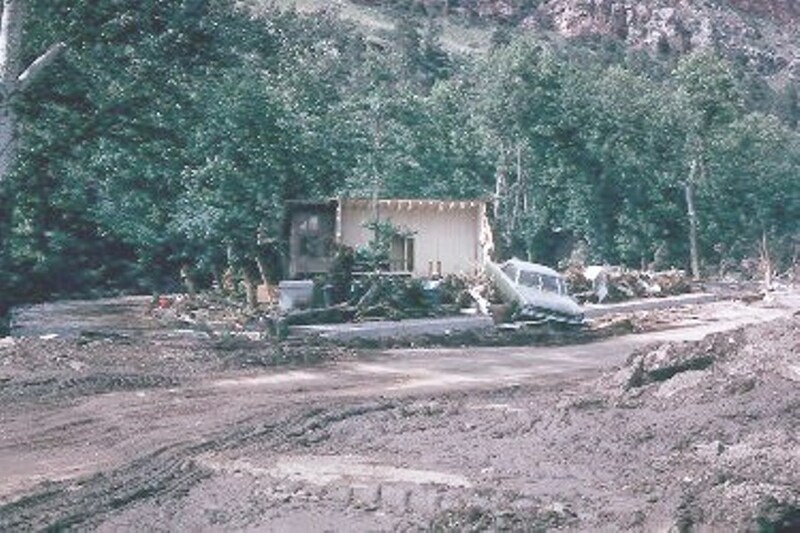 Canyon Lake after dam washed out. Sediment and debris immediately downstream of Canyon Lake. 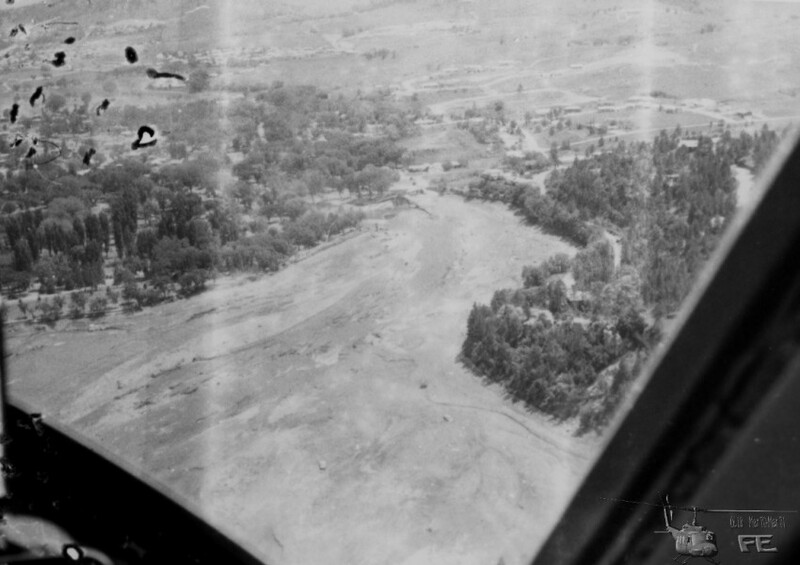 The morphology of Battle Creek below Keystone was changed by the flood. Where formerly a meandering stream in a grassy flood plain existed, there is now only a boulder swath. Cars and debris along Rapid Creek. 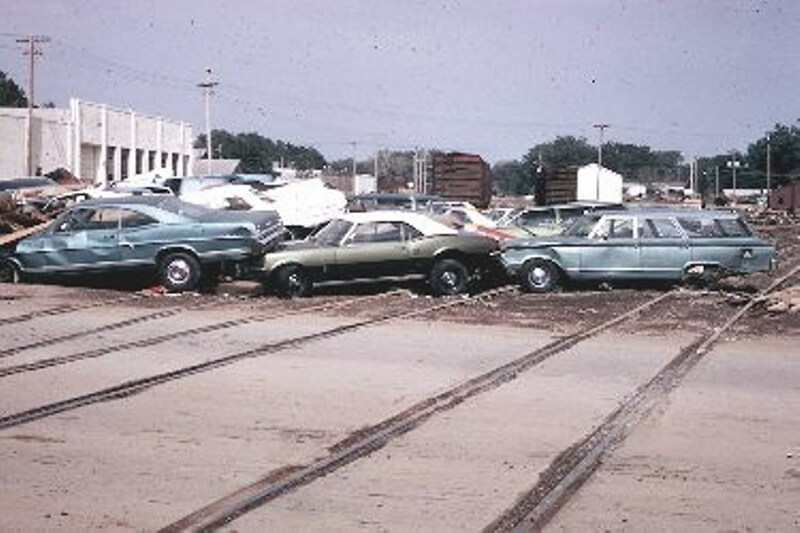 The flood caused over $160 million in damage. 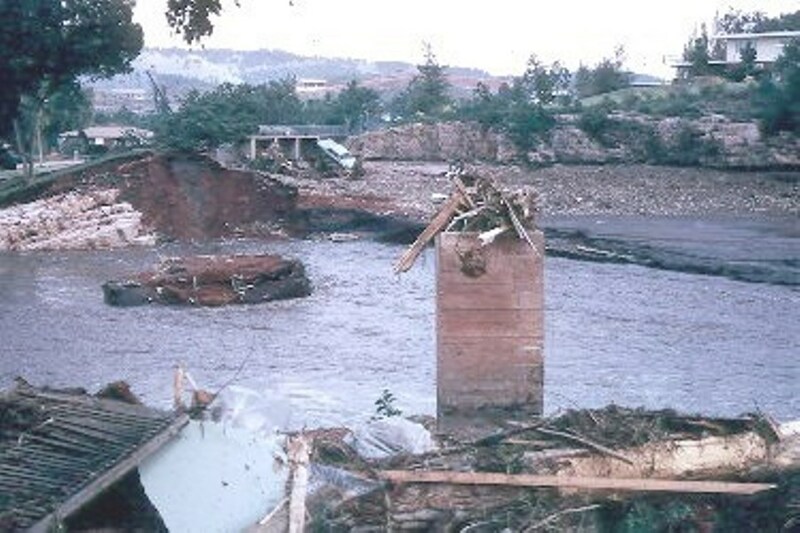 The wreckage of homes stacked up against bridge abutments. This picture was taken on the morning after the flood when many bodies were being found in debris such as this. People were moving into these new houses in western Rapid City the night of the flood. Close-up view of destroyed houses. The concrete silo houses a U.S. Geological Survey gage which had recorded a maximum of 2600 cubic feet per second in its 20 year history. 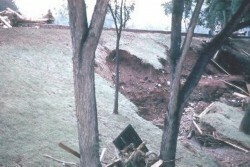 On June 9, 1972, the discharge at this point was 31,200 cubic feet per second. 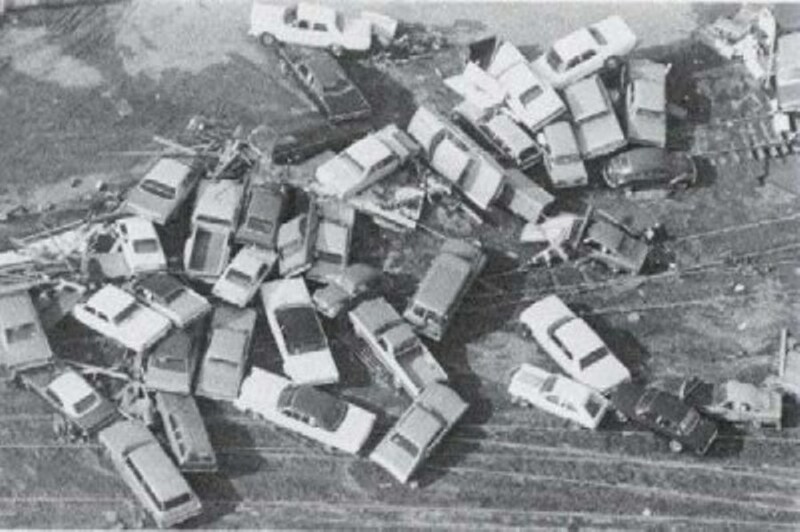 The flood swept cars around so that they pointed upstream, because of the heavy motor in the front and buoyancy of the cab. Another view of cars that were swept downstream during the flood. Photograph courtesy of Rapid City Journal. 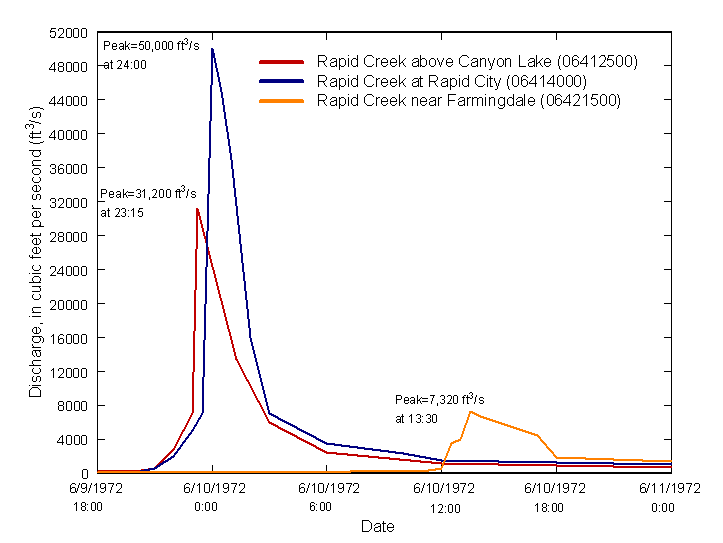 Hydrograph of flows at three Rapid Creek USGS gaging stations. 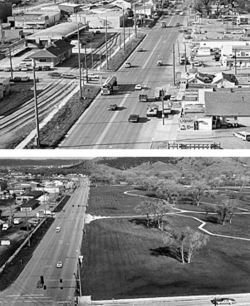 Looking west on Omaha Street, before 1972 (top) and after the development of the greenway (bottom) (Photo source: the Rapid City Journal). 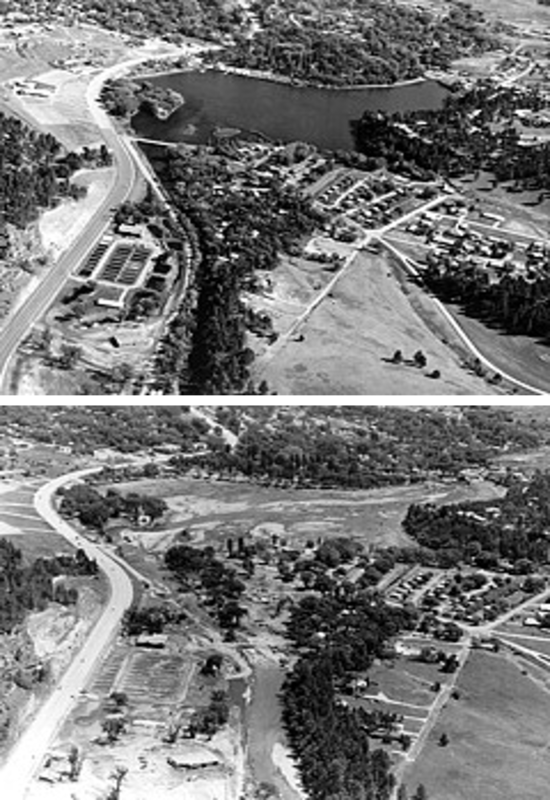 Canyon Lake Dam before (top) and after (bottom) the 1972 flood (Photo source: the Rapid City Journal). Don Barnett, mayor of Rapid City at the time, being interviewed about the night of the flood – part 1. Don Barnett, mayor of Rapid City at the time, being interviewed about the night of the flood – part 2. 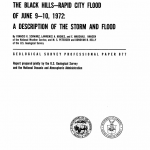 Don Barnett, mayor of Rapid City at the time, being interviewed about the night of the flood – part 3. 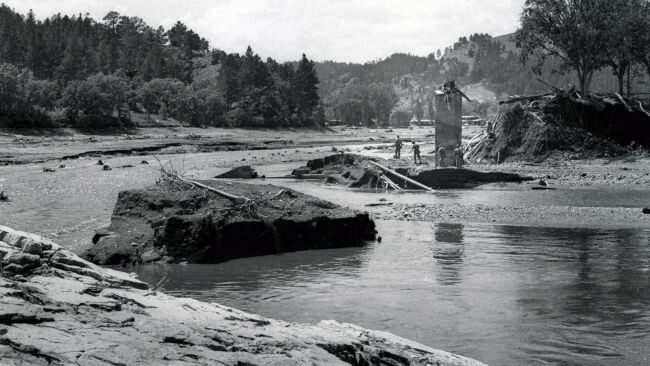 Don Barnett, mayor of Rapid City at the time, being interviewed about the night of the flood – part 4. Don Barnett, mayor of Rapid City at the time, being interviewed about the night of the flood – part 5. Don Barnett, mayor of Rapid City at the time, being interviewed about the night of the flood – part 6. General footage of the aftermath due to flooding. National Guard convoy on the way to Rapid City. Footage of National Guard and volunteers beginning to clean up. Footage of flooding taking place in town. 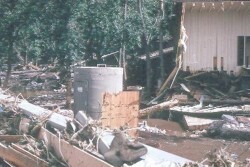 Footage of wreckage and damage done to trailer homes. Footage of flood debris being pushed up in Rapid City Waste Disposal Area. Footage of wrecker truck towing damaged flood vehicle to the holding area. 40 year memorial interview on the flood. Rapid City Journal interview with residents. 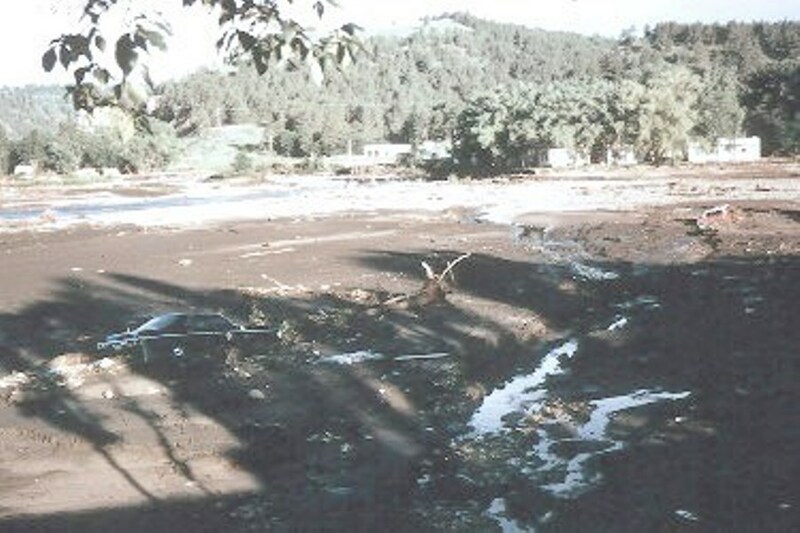 PMF magnitude floods do occur. 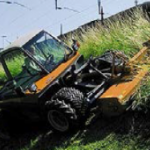 Dams should be inspected and monitored during and/or after large rainfall, seismic, or other unusual loading events. Dams may overtop for floods more frequent than the design flood if the spillway capacity is reduced (due to debris plugging or gate malfunction) or if a gated spillway is not operated as assumed in design studies. Jansen, Robert B. Dams and Public Safety. Denver, CO: U.S. Department of the Interior, Water and Power Resources Service, 1983. Print. Singh, Vijay P. Dam Breach Modeling Technology. N.p. : Kluwer Academic, 1996. Web. 4 June 2015.